A level crossing allowing passenger trains to run between a heritage line and the mainline network for the first time in 40 years has been opened. 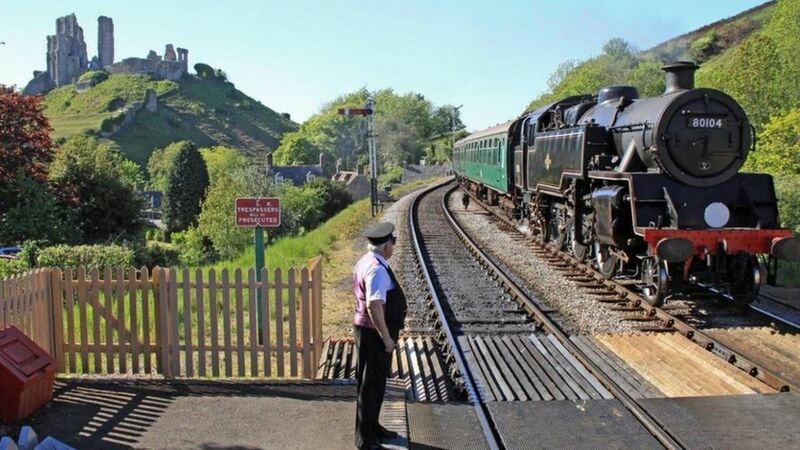 The £500,000 crossing, near Norden Station, completes the upgrade of the Swanage Railway to link to the main line to Wareham, Dorset. It was officially opened by High Sheriff of Dorset Sir Philip Williams. Swanage Railway Trust chairman Gavin Johns said it had been a 'hugely complex infrastructure project'. The work marks the completion of the 18-month restoration and upgrade of the three miles of former Network Rail line, to within a quarter of a mile of Worgret Junction and the main line to Wareham. A level crossing allowing passenger trains to run between a heritage line and the mainline network for the first time in 40 years is officially opened. Bulleid West Country Pacific 34072 257 Squadron at Norden on the Swanage Railway in July 1999. An open day at the Swanage Railway sees N Class 2-6-0 31806 and King Arthur 4-6-0 777 Sir Lamiel departing from the branch terminus with the 15.15 service. Standard class 4 no 80078 with a train on the Swanage Railway, near Corfe Castle, on 29 June 2000.